Amidst several breakthroughs in energy storage, a new concept of combining solar power with an ice machine has been gaining steam of late. Billed as a suitable alternative to the standard air conditioner that burns fossil fuels to cool humanity, this concept can easily revolutionize the way homes and offices are cooled in the near future. The Ice Bear is an oddball machine that doesn’t actually replace an air conditioner. Rather, it helps the air conditioner run more efficiently. This it does, by freezing a 450 gallon tank of water via electricity at night. The tank also features copper tubing that is wound through it. This copper tubing provides the necessary coolant to the evaporator coils present in nearby air conditioners. The end result is the ability to switch off the air conditioning compressor for nearly six hours on a hot sweltering afternoon, and still remain cool indoors. Ice Bear uses the concept of ice cooling in its operation. Ice cooling itself, is not a new concept. In fact, it dates back to ancient Rome and has also featured in the form of obscure cooling machines in many movies even before the first refrigerator was invented. The concept regained its popularity in recent decades as the demand for an energy efficient cooling system increased. Big businesses started looking out for ways to cool homes, offices and other establishments efficiently by using less energy, thereby saving costs during peak electricity hours. Ice Bear offers an efficient rooftop contraption that combines the energy of solar panels with an ice based energy storage option. Ice Bear can do wonders in areas where the demands for daytime air conditioning are high. Currently, air conditioning compressors and fans account for nearly 40% of the power demands during the peak daytime hours. Ice Bear offers a thermal energy storage option with ice that can cater to these demands for many hours on end, thus eliminating the need to rely on power plants and wires for air conditioning. In this case, the electricity generated by solar panels can be used to freeze the water tank at night and power the air conditioners during the day. With its efficient operation, Ice Bear can easily take over the cooling duties of the air conditioner during the mornings and evenings, and even in the afternoons in certain cases. The increasing demand for energy efficient air conditioners has led to a company developing a new concept called Ice Bear. 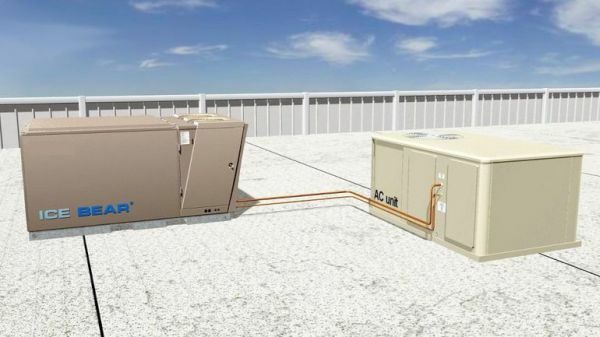 Dubbed as a solar powered air conditioner, this roof top contraption can help replace the cooling duties of rooftop air conditioners.